On entering the gallery it is not clear, at first, what connects these seventeen carefully crafted artworks, which are made from a diversity of materials ranging from Lego to gold leaf. On closer examination it becomes evident through their size, form and subject that they all have a strong connection with the home and, moreover, that they are linked by an engagement with a particular group of people. These works also embody the relationships between the artists Lin Holland and Jane Poulton, who have collaborated in an apparently seamless practice, and the eighteen residents of West Everton with whom they have worked. It is hard to imagine the journey that has led to this point. West Everton has been repeatedly regenerated over the last two hundred years. 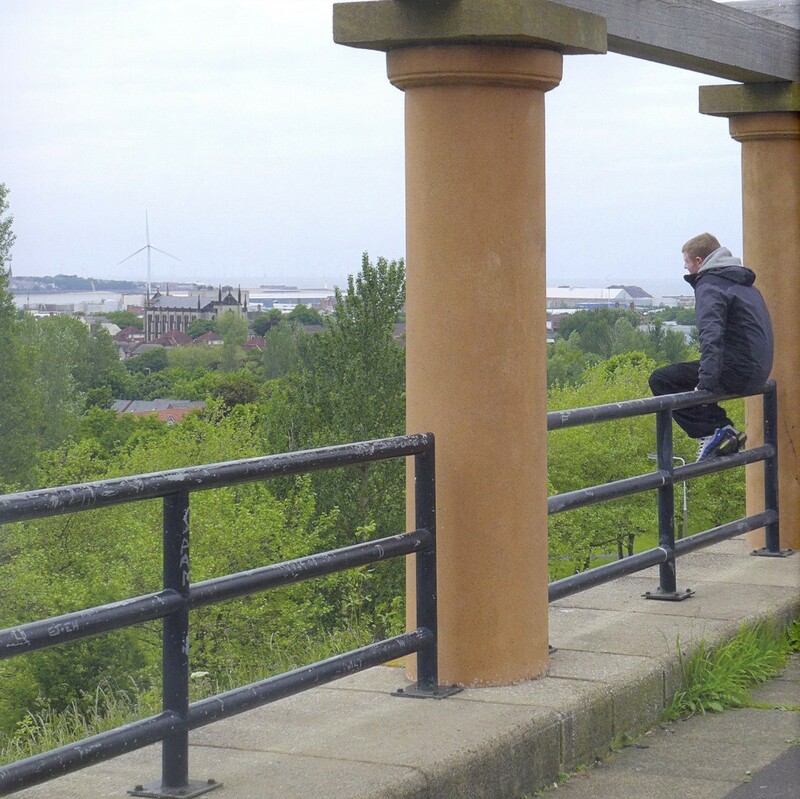 Everton Park is a vantage point that offers panoramic views of the area. Looking through traces of 1980's pastiche neoclassical architecture in concrete and wood, a patchwork of housing styles is revealed; influenced by past planning fads, all are squeezed into grids mapped out for a distant epoch. Within these architectural layers lives a strong community, The Lost Tribes of Everton and Scottie Road (1). The population that has grown up in this area is not necessarily economically prosperous, but is socially and culturally rich, and one that has survived the cyclical redesign of its location. At its centre is the West Everton Community Council (WECC), which, since the mid-1960's, has been a conduit and gatekeeper between outside agencies and the people it supports and cares for. The geographer Doreen Massey states that "places are spaces of social relations" as she describes the relationship that her own family had with one housing estate over a fifty-year period (2). It seems that people cannot be separated from their built environment. The above ingredients provide the recipe for The Object Project, with the added element of the Creative Campus of Liverpool Hope University. This artist-initiated project was born out of existing relationships between the university and WECC, which led, in part, to shaping the project. One aspect of The Object Project was to provide insight into the processes used by artists to make contemporary art. This began by Holland & Poulton responding to the participants' own cherished objects (complete with heartfelt provenance and personal meaning), and to the personalities of their owners and the decor of their domestic spaces. The exchange of trust was centred on the internal, semi-private public spaces into which we invite the visitor - the living room, front room and lounge - rooms that reflect our own aesthetic influences and become places for self-expression. The French philosopher Gaston Bachelard describes the house as "our corner of the world". As has often been said, it is our first universe, a real cosmos in every sense of the word. (3) It was in this place that conversations were conducted between the artists and the occupant; dialogues that are central to the work but ones that a wider audience will never be party to, except through the mediated language of the resultant artwork. In The Object Project, the domestic space eventually becomes the site for a piece of contemporary art that can also exist within the canon of the contemporary art gallery. Videos, sound pieces and stand-alone sculptures were all carefully installed in the participants homes for a short while before having another, more public, presentation in the gallery. It is the premise of the works that makes them stand out from other socially engaged projects; these were not commissions designed to appease the commissioner but artists' considered responses to the archive of information, diligently collected and researched about each person, their object, and their environment. This hugely ambitious project has many layers: an artists' collaboration, using the processes of participatory art to work with eighteen people, underpinned by a pedagogical programme that worked with not one, but three galleries, a university and a community council. It has had many positive impacts. Firstly upon the artists, who have now developed a completely different approach to their practice and have witnessed how this method creates artworks that not only speak of place but also of people. Secondly upon the participants who have been rewarded for their trust and full-hearted engagement by being given the great gift of having an artwork made specifically for them and the spaces they inhabit. And, finally, upon WECC which now has a new template of community engagement that will undoubtedly affect the way they work with artists in the future. The Object Project is set against a background of high-profile socially engaged practices in the city that have taken on a life of their own. Tenantspin, a project supported by FACT, which originally engaged with the occupants of the since demolished Coronation Court tower block, was instigated as a pilot project by Danish artists Superflex and has now been running for ten years (4). More recently, in a project commissioned by Liverpool Biennial, Dutch artist Jeanne van Heeswijk worked with people in North Liverpool on the 2Up 2Down project to transform a condemned building into a community bakery (5). Art historian Claire Bishop observes that, "At a certain point art has to hand over to other institutions if social change is to be achieved; it is not enough to keep producing activist art." (6) This was the decision that Superflex and Jeanne van Heeswijk and their respective communities had to make once the initial success of the projects had been established. Both involved community dialogues, architectural spaces, and pedagogical programmes, not unlike The Object Project. What makes this project so unique and successful is that it originated with artists who already had a deep commitment and long-term connection to the city. Holland & Poulton have managed to create this extraordinary work without the agendas or curatorial support of large arts organisations, but by forming lasting partnerships directly with the institutions of the community and, maybe more importantly, by forming lasting friendships with the participants who provided the essential core and inspiration for the work. (4) www.tenantspin.org/what-we-do/history/ In 1999 the Foundation for Art & Creative Technology (FACT) piloted an Internet TV project with city-wide high-rise tenants and the Government agency Liverpool Housing Action Trust (HAT). Danish artists' collective Superflex provided the technical infrastructure and theoretical possibilities for this new DIY broadcasting technology. (5) www.2up2down.org.uk Over the last two and a half years, artist Jeanne van Heeswijk, commissioned by the Liverpool Biennial, has been working with people from Anfield and Breckfield to rethink the future of their neighbourhood. 2Up 2Down provides a way for local people to make real social and physical changes to their environment.